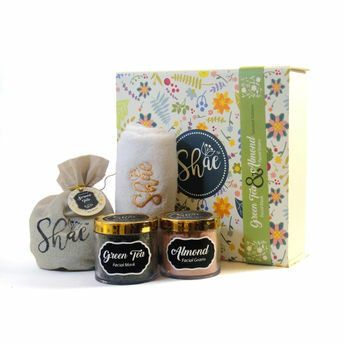 The Green Tea facial Mask & Almond Facial Grains Spa Gift Kit by Shae consists of a range of handcrafted beauty products. This spa kit also contains a herbal tea pouch made of exotic herbs and a plush towel. 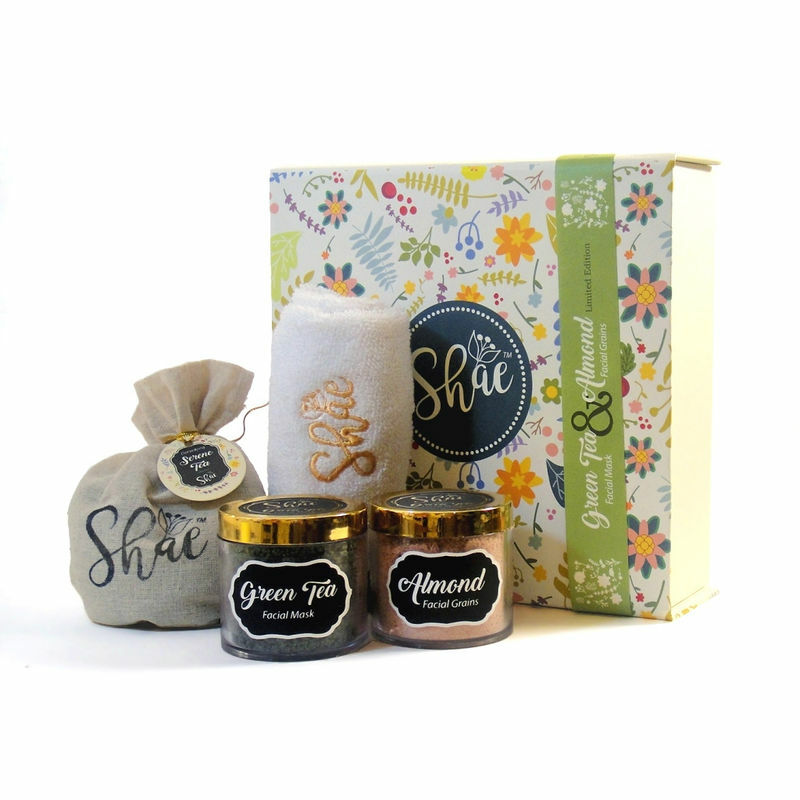 Each box is 8*8*2 inch so its very handy but accommodates two jars of handmade beauty product, a plush little towel & a signature herbal tea giving you a perfect spa gift kit for varied occasions. A green clay mask that helps minimize pores. Green tea, honey and green French clay come together to form this nourishing and detoxifying face mask. An intense vitamin and mineral honey treatment nurtures your skin while green tea along with French clay absorb impure oils from the pores, tightening the face. A gentle exfoliating facial scrub with a blend of natural exfoliates to gently nourish cleanse and brighten your skin. Almonds exfoliate and moisturize deep within, pink French clay absorbs toxin laden oil, and the combination of cinnamon and nutmeg improves blood circulation on the surface, setting off a natural glow.